It is rare for a restaurant to be perfect in all areas but Roy's has done just that. From the initial entrance to the restaurant, you are greeted with warm and prompt service even when the restaurant was busy. Our waiter was very good at knowing when we needed our space to talk and when we needed his attention which made our entire dining experience seamless. Roy's is an upscale Hawaiian Fusion restaurant that shines as a star even among the very best of restaurants in Vegas. Our meals were all done to perfection from grilling the steaks properly to not overcooking the Butterfish. The Butterfish has a reminiscence of a Sea Bass and glazed with an Asian sauce over a bed of Jasmine rice that were surround with a dual puree. The waiter told us this is one of their most popular dishes and after the fish melted in our mouths we understand why. 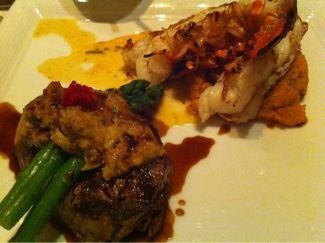 My filet and lobster tail was treated with equal attention and finesse. We fished off the evening with 2 orders of the Molton Chocolate Souffle with a scoop of high quality vanilla ice-cream. It was delicious! Although the food alone would merit regular visits, their customer service was just over the top. Even though my 9 year son wasn't that hungry, they still catered to him and brought out a complementary child's appetizer and a custom ice-cream sundae with his name spelled out in chocolate on the dish. Other restaurants should take not of what Roy's is doing if they want to be a flourishing and cutting edge restaurant that will set them apart from the many dining choices in the Las Vegas area.